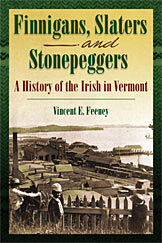 The first book on the coming of the Irish to Vermont: from the Scots-Irish of Londonderry in the 1770s, through the famine Irish marble workers of West Rutland and slate workers of Castleton and Poultney, to politicians like mayors Burke of Burlington and Corry of Montpelier in the early 20th century. A short epilogue recounts the success of Irish American Vermonters in our own day, including Senator Patrick Leahy. Based on extensive research with primary documents, the author describes, era by era, why the Irish left Ireland, how they traveled, what attracted them to Vermont, and how they made new lives for themselves and their descendants throughout the Green Mountain State. Over 45 prints, photographs and maps, foreword, preface, extensive chapter notes and bibliography, index. ABOUT THE AUTHOR: Vincent E. Feeney received a BA from San Jose State University, MA from the University of Vermont, and PhD from the University of Washington, all in History. He was Adjunct Professor of History at the University of Vermont 1977-2006. Since 2003 he has been a Lecturer for the Vermont Humanities Council. Feeney is also the author of Vermont: An Illustrated History with John Duffy (American Heritage Press, 2000) and The Great Falls on Onion River: A History of Winooski, Vermont (Winooski Historical Society, 2002). He is a member of the Vermont Historical Society, Center for Research on Vermont, Chittenden County Historical Society (President 1999-2003), and the Winooski Historical Society. He lives with his wife in Marshfield, Vermont. A meticulously researched, beautifully written book by the scholar who knows most about the Irish in Vermont. This long-awaited book fills a critical gap in Vermont studies, and is a model for future historians. Dona Brown, Associate Professor of History, University of Vermont, author of Inventing New England: Regional Tourism in the Nineteenth Century. In his carefully researched and meticulously referenced book, the author has provided both the serious and casual student of Vermont history with a fresh and engaging perspective on our ancestors that informs the literature as well as the reader. If it is true that we are not real until we are recorded in history, then this book makes the Irish in Vermont real. It is a must for all Irish Americans in Vermont, and for everyone else for that matter. It is all our story.